Get your Australian Shepherd training off to a good start with these clicker puppy training ideas. Say your dog’s name once. If he turns to look at you, C/T. If he doesn’t, make a kissy noise. When he looks at you, C/T. If he’s already looking at you, say his name and C/T. The purpose of this exercise is to teach him that his name is a good thing. After 10-20 times of this, he should instantly look at you when you say his name. If not, keep working at it. Have friends and family join in. Get a group of people together, have one person say Bruiser’s name, and then C/T when he looks. Everyone takes turns in random order. Note: If Bruiser already associates his name with getting in trouble, be sure and use a VERY high value reward. Try baby food in a jar, chicken, scrambled eggs, anything that really excites your dog. It’s important he learns that hearing his name is rewarding! C/T Bruiser whenever he makes eye contact with you, even if you haven’t said his name. When he’s reached the point where he’s comfortable looking at you for several seconds, add the cue ‘watch me’. As always, start these exercises in a low distraction area, and wait until he’s responding reliably before adding distractions. Wait for Bruiser to sit. When he does, C/T. It’s okay if his bottom pops up right away, as long as you clicked while his bottom was on the ground. Now, wait until he sits again, and C/T. After a few repetitions he will catch on, and realize the sit is what’s being clicked. Then you probably won’t be able to get him to move, his bottom is so firmly planted on the ground! So take a few steps backward and encourage him to come to you. Keep moving around the room, and Bruiser will come to you and sit. When he is reliably offering a sit at least 90% of the time, start saying ‘Sit’ AS he sits. Then start saying it just before he sits, and pretty soon the word will elicit the behavior. If Bruiser won’t offer a sit, you can lure it. Simply hold a treat just barely above his head, and move it back toward the tail. (Be sure the treat isn’t too high, because he will try to jump to get it.) He will try to follow it with his eyes, and in order to do so will tip his head backwards. As this happens he will be forced to sit in order to follow the treat. When he sits, C/T. After a few repetitions, stop luring. You want Bruiser to think for himself. 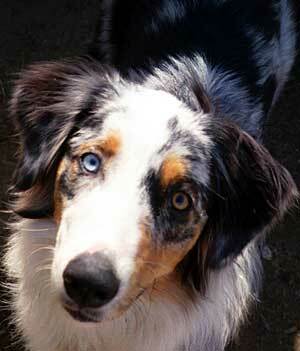 Weasel comes from a pair of working cattle dogs in Bakersfield, CA. First of all, be sure that everyone in the household understands what ‘down’ means. Down means ‘lay down’, whereas ‘off’ means ‘get off of whatever you’re currently on’ (person, place, or thing). The easiest way to teach down is probably to lure it. Tell Bruiser to sit, but only give him praise, no C/T. (Remember, ‘click’ ends the behavior. You’re not teaching sit, you’re teaching down, so he hasn’t earned his click yet.) Now, take a treat, and move it from his nose down just in front of his front feet. As he follows it with his nose, he will be forced to day down. When his elbows hit the ground, C/T. With some dogs, you may have to slowly move the treat along the ground, away from the dog, to get him to follow it into a down. If Bruiser refuses to lay down, make sure you’re practicing in a low distraction area like the bathroom. When there’s nothing interesting going on, Bruiser will be more likely to cooperate. After luring a few downs, stop luring with a treat and just move your hand in a downward motion. Bruiser will follow your hand. Then, start saying ‘down’ as you gesture. After a few more repetitions start saying ‘down’ to elicit the behavior. Always ‘fade’ the lure as quickly as possibly, to encourage Bruiser to figure things out on his own. When Bruiser is sitting, call him forward. The second he stands, C/T. You can lure it by holding a treat out, and moving it away from him. When he stands, let him nibble on the treat before giving it to him, to encourage him to stand still for a moment. Introduce the cue as you did for Sit and Down. Stay tuned for more basic dog training and clicker dog training articles. If you are interested in trying clicker dog training with your Aussie you can get the clicker dog training aid i-Click from Karen Pryor Clicker Training. For clicker dog training classes in Imperial Beach or San Diego county area contact Lynn Whinery at Bonza Canine Education.